The Global (mobile) Suppliers Association has launched what it claims is the first global database of commercial 5G devices. This is the latest component of the GSA Analyser for Mobile Broadband Devices (GAMBoD) database, a tool designed to help industry stakeholders keep track of all this stuff. 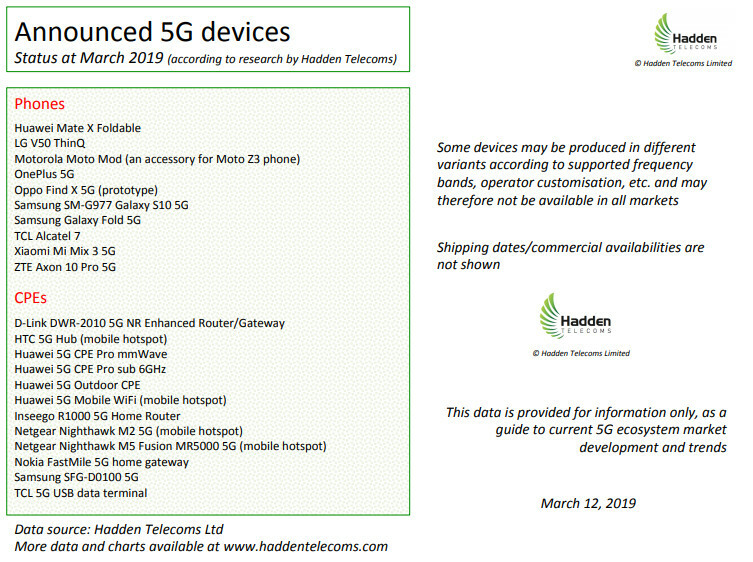 By pure coincidence, or maybe not, its launch comes on the same day at the publication of the latest 5G Market Reality Check from Hadden Telecoms. The eponymous Alan Hadden was for some time the VP of Research at the GSA, before deciding to go it alone with a similar set of analytical services. His company’s latest publication lists the 211 operators around the world known to be investing in 5G, but earlier this month it too was alking devices, as you can see in the slide below.